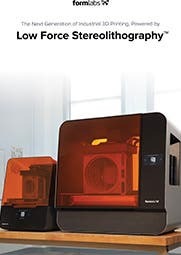 The Form 3 is a Low Force Stereolithography (LFS) printer. This new technology balances speed and detail to give intricate prints quickly. Adaptive layer height allows for you to print the non-detailed parts of your model more quickly (at a lower resolution), whilst retaining the high resolution required for the intricate areas. LFS gently flexes the tank to release the newly cured layer. This technique allows for much less force on the printed layer and no lateral peel force is necessary. Because of this, the supports are very light touch – a simple twist should remove them completely from the model. 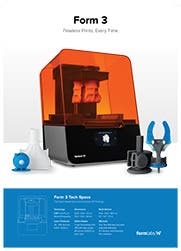 The Form 3 brings in the ability to set off a print remotely. 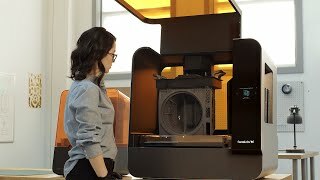 Orientate and support the model as required in PreForm, Formlabs’ printing software, and send it to the printer from wherever you are. Design and prepare your model at home in an evening and come into the office to have it printed in the morning. 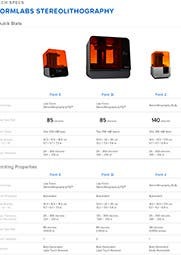 There are ten Formlabs resins that can be used with the Form 3 immediately, these are: Grey, Black, White, Clear, Draft, Tough, High Temp V2, Durable, Castable Wax and Dental Model. Others are in compatibility testing and certification and should be released shortly. You can also use third-party resins with the Form 3 by using Open Mode. Here are some of the common questions we get for Form 3 Complete Package, if you have any more questions, please don't hesitate to email web@goprint3d.co.uk or phone 01765 540 115.